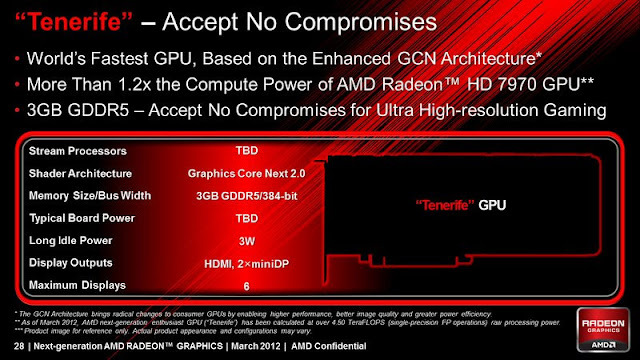 Home / AMD / Graphic card / Hardware / News / Specifications / Technology / AMD Tenerife HD 7980/7990 graphic card details ? Take this one with a grain of salt, Softpedia report via OBR-Hardware what is called the “Tenerife”, the next generation of graphic core from AMD. The information appeared on a screenshot showing the successor to the Tahiti graphics processing unite which is used on the new AMD HD 7000 series, the new core technology is called “Tenerife” based on a new "Enhanced Graphics CoreNext" architecture and a shader architecture GCN 2.0, what is noticeable on the screen-shot "World's Fastest GPU" and "Accept no compromises" is that the new graphic card will target the next generation of Nvidia's Kepler card after a previous announcement of this last one said that Kepler GPU will hit hard the HD 7970.